Summary of Eight Hikes in Alta Badia. Left: Map created in 2008. Right: Update map created in 2018. We were in the Alta Badia for 10 full days and managed to get 8 hikes in. We saw just got a taste of the region and we know we'll be back.We estimate that we hiked about 110 km (68 miles) in about 48 hours over the 8 hikes. The time of our hikes, early June, is still low season so you won’t see a lot of folks on the trail nor will many restaurants, hotels, or more importantly, rifugi (mountain huts) open. For us, that’s okay. Everything starts to pick up here we were told around July 1st. It would have been nice to have more rifugi open so we could lessen what we were carrying food-wise. We had a car so that we could drive to trail heads. We did not use public transportation. It exists though. We did not intentionally do any via ferrata, except a bit at Lagazuoi which was necessary to get in and out of the Lagazuoi tunnel (if you could classify that as a ferrata). We saw all sorts of weather in early June: sun, rain, lightning and thunder, hail, warm, and cold. Everyone kept saying this was a very strange spring as much of northern Italy has been experiencing. Regardless of this year, we would plan for changing weather in early June. See this post for the maps we used for hiking. All hikes were interesting in their own way, but the Langkofel Hike and the Sass de Putia Hike stand out because of the experience of circumnavigating a large massif (massiccio in Italian) and getting a good sense of the geography. We took the Santa-Croce chair lifts (two of them) to the Santa-Croce rifugio at 2045m. Then we took #15 heading south to #12 heading east, then doubled back on ourselves and took #12a to #15 back to the chair lift. Top Row. Left: Chairlifts takes you from 1365 to 2050 meters. Center Left: Passing over the village of San Leonardo. Center Right: New larch needles. Right: Looking southwest toward Colfosco where we are staying and the profile of Sassongher. Bottom Row. Left: Sassongher. Center Left: Chiesa Santa Croce. Center Right: Working our way up to the Forcela di Medesc. Right: Looking southwest toward Corvara, Colfosco, the Sella Group and Sassongher. We started at Capanna Alpina and our goal was to hike to Rifugio Fanes. The weather dogged us most of the day leading to surreal misty views. Capanna Alpina is a rifugio just southeast of San Cassiano; there is parking lot there. From the parking lot, we followed trail # 11 all the way to the Rifugio. #11 and Alta Via 1 coincide for part of the way. Left: Trail #11 Parco naturale Fanes-Senes-Braies. Center Left: View from starting point of hike looking up into the park. Center Right: View from the trail back down to where we started. Right: Part of hike where trail #11 flattens out. 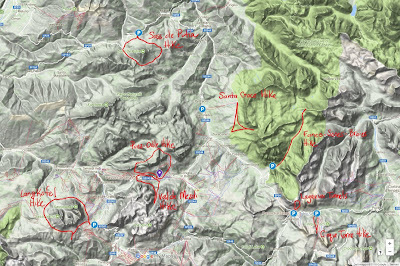 This was a loop hike that we started and ended from our hotel in Colfosco and which passed through the Puez-Odle park. We walked from the church in Colfosco up to the Edelweiss rifugio (follow the signs). From there we headed west on trail #8. When you reach Jimmy Hutte take trail #2 (which coincides with Alta Via 2) for some time passing by Lago Crespeina. At the next major trail intersection take trail #4 back to the Edelweiss rifugio. Left: An example of the typical barn structure found in the pastures of Alta Badia and the Dolomites. Center Left: Heading to Rifugio Jimmy near Passo Gardena. Center Right: The scene in the Puez-Odle park on a rainy day. Right: Heading south back to Colfosco; the Sella Group and Val di Mezdi in the distance. Top Row. Left: Group Croda da Lago to the east of Cinque Torre. Center Left: View northeast - Penes de Fouzargo. Center Right: Rifugio Nuvolau where we were earlier in the hike. Right: Near Cinque Torre (5 Towers) where there is an open air war museum. Bottom Row. Left: On the south side of Cinque Torre. Center Left: Serrated mountains in the distance. Center Right: Exploring parts of the open air war museum near Cinque Torre. Right: Classic shot of the Croda da Lago group. We drove from Colfosco to Passo Sella (2176 m) and parked. We decided to circumnavigate the Sassolungo Group clockwise, but first we took a detour to climb up to Col Rodella (2484m) for a quick look over val di Fassa. We reversed our steps a bit, and then followed trail #4-557 west. At Rifugio Sasso Piatto we caught trail #527 heading north and then east. Eventually we met up with trail #525 which took us back to the Passo Sella parking lot. Top Row. Left: Heading to Rifugio Sasso Piatto. Center Left: A tree grows on a rock in the La città dei sassi. Center Right: The Lankofel (Sassolungo) Group as seen from Passo Gardena. Right: The nearby Sella Group in light and shadow. Bottom Row. Left: West edge of the Sella Group as seen from Passo Sella. Center Left: Looking north toward Gardena Pass from Sella Pass. Center Right: On the north side of the Lankofel Group and stormy weather. Right: View from Col Rodella back on the Gruppo Sassolungo. You can see the trail we hiked. Leaving the Passo delle Erbe parking lot we took trail #8a until we reach the base of the Sass de Putia group and then we headed west to begin a counter-clockwise circumnavigation still on #8a. Eventually we met up with #4 (coincides with Alta Via 2) to the Forcela de Putia (2357 m). At this point we took a detour to climb to the secondary peak of Putia (2815m). (The real peak is at 2875 m.) After coming back from this 2 hour excursion we continued around following trail #35 for some time across the south side of the mountain group. Eventually we met up with trail #8b which took us back to our starting point. Top Row. Left: Start of hike heading toward base of Sass de Putia. Center Left: The start of the path to the peak of Sass de Putia. Center Right: View south toward Puez Odle park. Right: Walking in the malga of the south side of Sass de Putia. Bottom Row. Walking on the south, southeast, and east of Sass de Putia with its characteristic wooden structures. The goal of this hike was to visit the famous WWI Lagazuoi Tunnels. The tunnels and trenches and war works were part of the bitter fight between the Austrians and the Italian for control over this area. We took the cable car up from Passo Falzarego to Rifugio Lagazuoi. From there we took some time taking in the view and then headed for the tunnel entrance. The approach to the tunnel and the exit were a little tricky. There were cables to hold on to, but if you are not one for heights, it may not be the best thing to do. Once inside the tunnel we spend several hours exploring passageways. We rented helmets and hand lamps. Gloves wouldn't be a bad idea either. Initially, it's hard to grasp the layout of the tunnels. When you first get off the cable car from the valley to Rifugio Lagazuoi and you head east for a few steps, you see some tunnels and trenches. These were the Austrian tunnels, who held the top of the ridge. To get to the Italian tunnels you have to walk a bit more on an interesting if not a little nerve-racking trail. Top Row. Left: Entrance pointing to the entrance to the "Italian" tunnels. Center Left: View north from Rifugio Lagazuio. Center Right: View from Rifugio Lagazuio toward Cinque Torre. Right: Rifugio Lagazuoi is on the cliff and is the starting point. Bottom Row: Left: Some tunnels have cables you can use to hold as you explore outside. Center Left: A tunnel in Lagazuoi. Center Right: Working our way to the entrance of the "Italian" tunnels. Right: After leaving the tunnels, there is still a ways to go to get back to the valley. 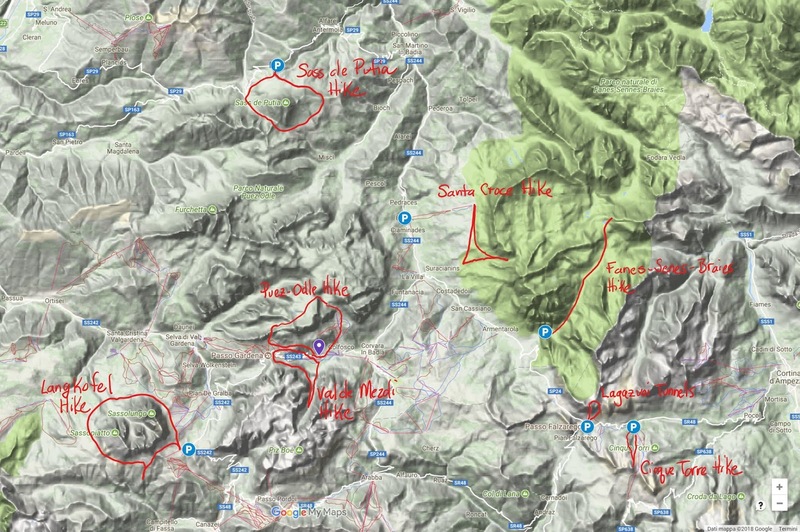 This hike starts from Colfosco. We took trail #651 to #26 to #666 to Passo Gardena to #8 to #8c which dropped us back in Colfosco. We looped around the valley between Colfosco to the east and Passo Gardena in the west. First we climbed a ways up and into Val de Mezdi, then we retraced our steps and headed west to Pisciadú Waterfalls and continued around (clockwise) to Passo Gardena and then back to Colfosco. Top Row: Left: Walking toward Passo Gardena. Center Left: Onobrychis montana – Mountain Sainfoin (Lupinella montana). Center Right: Pinguicula alpina – Alpine butterwort is insectivorous. Right: View from Val de Mezdi north toward Colfosco. Bottom Row: Left: Colfosco, with Sella Group in background. Center Left: Trollius europaeus in pastures of Colfosco. Center Right: View from Val de Mezdi back toward Colfosco. Right: Val de Mezdi as seen from Passo Gardena.